...and sets them down like snowflakes." That's how one engineer describes his company's recent retrofit of a three-axis servo transfer system to a 2600-ton press. Results are impressivepress speed and OEE have doubled. ...leads this Ontario Tier Two automotive metalformer to make the move to transfer stamping, to provide tight-tolerance transmission components. What follows represents a small sampling of hundreds of new products displayed at the giant tradeshow held last November in Chicago; we'll present more product introductions in future issues of MetalForming. 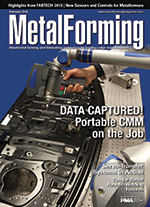 Note: This issue also includes an article describing new sensors and control technology debuted at FABTECH.